Q. How do I install the Thomson Reuters Spreadsheet Link Excel add-in for Thomson ONE? To install the Thomson ONE Thomson Reuters Spreadsheet Link (TRSL) Excel add-in on your own laptop or personal computer, log in to Thomson ONE (see link below - this add-in is not compatible with Windows 10, nor Excel 2016). Then look under the Tools and Tips button > Download Centre > Thomson Reuters Spreadsheet Link (TRSL) for the installation program and download guide. See below for the installation steps. Please note that Deal Analytics is not part of our academic subscription so this option should not be downloaded. 1. 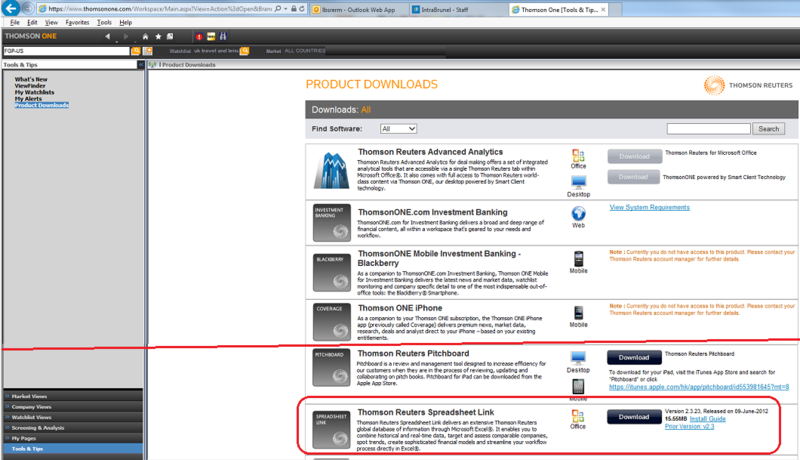 Thomson Reuters Download Centre - use the TRSL download button at the bottom - see also the guide. If you need advice during installation or on how to use the add-in please contact Customer Support: +44 870 458 1052. Please note, due to security restrictions, you will not be able to install the excel add-in on a networked computer on campus yourself (it will be deleted automatically leading a corrupt link next time you try to use it), so we have installed it on the computers in the Library Teaching Rooms 2 (BANN 230 on floor 2) and 4 (BANN 317b on floor 3). You will need to use one of the ten unique username and passwords given on the IntraBrunel password page to sign in using the Excel add-in - use its Options button. How do I log into Thomson ONE (T1.com)?